The government of the German state of Baden, seeking to put an end to the movement for democracy, arrests leaders of the movement. Protests against the arrests turn into an armed uprising. 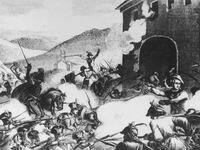 The government invites Prussian troops to come and put down the rebellion; with their help, the revolt is put down on April 20. A further revolt flares up the following year. Workers at the Electric Auto-Lite company of Toledo, Ohio, go out on strike demanding that the company recognize their union. They also want a wage increase, improved working conditions, and an end to harassment of, and discrimination against, union members. The strike draws support from the socialist American Workers Party (AWP), which sends organizers to help. The AWP sets out to organize unemployed workers in support of the strike; they succeed in bringing out thousands of jobless workers to help surround the plant and shut it down. The company appeals to the capitalist courts to prevent picketing, and are quickly granted an injunction forbidding more than a handful of pickets outside the gates. Despite continuing arrests, the workers defy the injunction: by May 23, there are more than 10,000 pickets outside the plant gates. Police attack, and a full-fledged battle breaks out that continues over the next five days. 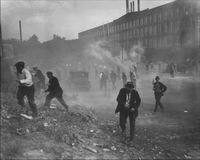 Two strikers are killed, and more than 200 are injured. The strike ends when the company, prodded by a federal mediator, agrees to recognize the union, grant a wage increase, and rehire all workers who had been fired for their actions during the strike. On June 9th, a massive victory parade in Toledo marks the end of the strike, which is regarded as one of the most important strikes in U.S. labour history. 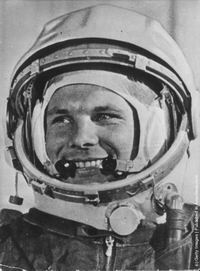 Soviet cosmonaut Yuri Gagarin becomes the first human in space aboard the spacecraft Vostok 1.